This is a great article to keep in mind when you consider marketing your camp to any parent but especially a parent sending their kid away for the first time to your camp. It is a first-person description of the anxiety that a parent encounters while their kid is away. 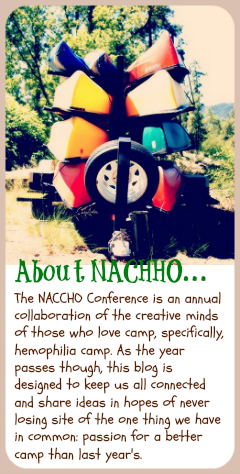 What does your camp do to keep parents in the know about camp? 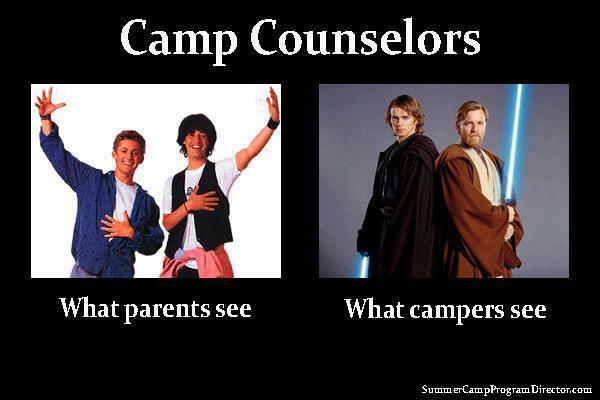 Isn't it funny how different campers and parents view counselors? Never underestimate the positivity that camp can bring. Below are some facts about the current youth in America. When you read it, you may feel really discouraged. 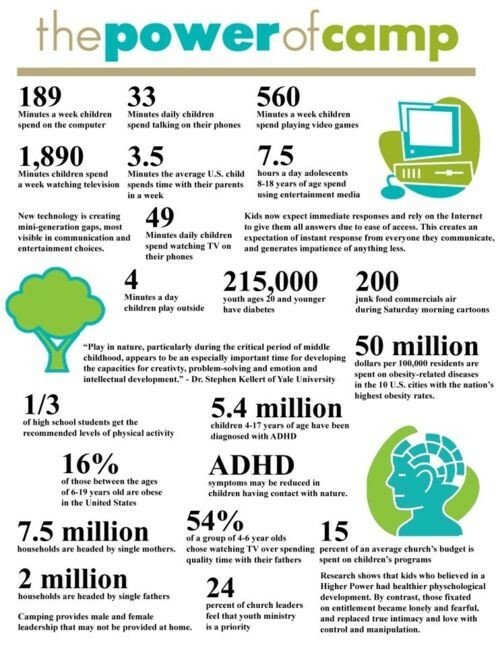 I challenge anyone who looks at this to turn these disheartening facts into a basis for developing your camp program. Our theme at NACCHO this year is "Building Today for Tomorrow". What does this mean to you? For some kids, camp may just seem like a chance to get away for a bit, to reconnect with old friends, maybe get a new "boyfriend" :). With the events that occurred on Friday in Connecticut, it brings light to a lot of obvious issues: violence, school security, gun control, etc. Something I don't hear people talking about is the impact that places like school, youth programs, or even summer camps have on a kid and what events like this shooting do to the image of these programs. Look below at these stats. This is what kids are living with on a daily basis. It's not easy to be a kid now. For many, school is the most consistent thing they have in their life. They know that every day they can show up at 8am and the same teacher will be there waiting for them. They will hang their backpack on the same hook and go sit in the same desk that thoughtfully has their name written on it. Come lunch, they will have a warm meal (something they may not have at home in all cases) and afterward, they can play outside and just.be.a.kid. Unfortunately, when they go home, the only thing that is predictable for them is the unpredictability and the lack of support that some kids receive. Summer camp is the same way. I know that at our camp, some of these kids eat better than they do all year (while the rest of us cringe at the words "sloppy joe"). Some of them even just have a bed to lie in and not a hard floor. There are adults there who ask them about their day and have conversations with them, not at them. At camp, the number one priority is camper safety and well being. This could be a first for some kids. As a former educator, I had pangs of sadness on Friday because I know that there are children out there who view school as the safest retreat they know. It also made me reflect on how a kid feels when they come to our camp. They don't say it's the best week of their life because they enjoy living the life that the stats below suggest. They say it's the best week of their life because in many ways, it defies the stats below. Camp doesn't change. Camp is always there. Camp listens. Camp cares. Camp loves kids. Perhaps, this is just the rambling of one, but I encourage you to look at what camp really means to some kids and use that reflection to keep you focused as you enter the exciting months of camp planning. Here's a great conversation! 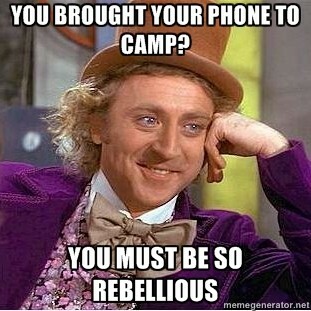 What is your camp's policy on electronic devices such as cell phones, iPods, tablets, etc. Disconnect to reconnect or allow them? Always intervene when you hear campers put each other down. Never believe a camper who says, "It doesn't bother me." In our lives we are either growing into the people we can become or putting energy into protecting who we are. We can't have both simultaneously. Camp is one of the few places where we can control the external environment enough to give children an extended opportunity to grow. Too many stories of kids who wind up in great trouble start with the innocent name calling and the adults who ignored it when they had the chance to do something about it. Letting it slide by — even once — sends a message that you condone the behavior, or at the least that you'll only respond when it is extreme. It truly doesn't matter how skilled a counselor you are at intervening, just saying something about it being "not okay" or "un-cool" is enough to disrupt the flow of what is going on. Intervene consistently, and you'll establish a culture that does not permit this negative behavior. Who knows, doing so may also save a life someday.